Purrdelis' welcomes two new arrivals to our pedigreed family. The bright red kitty on the left is SashimiKats Caliente of Purrdelis (or Cal for short). The sweetly posed kitty to Cal's right is KCDancers BK of Purrdelis (simply BK). 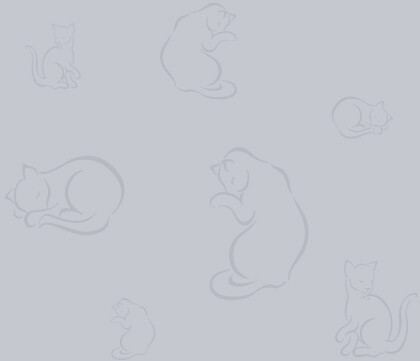 To learn more about these wonderful kitties, please click on their names above. We were very sad to say good-bye to GC Caellcats Delilah of Purrdelis. When we made the hard decision to stop breeding cats, we had to honor Delilah's breeder's request that she go on to produce more beautiful American Shorthairs much like herself. Luckily we knew a great person, Kendall Smith, who had been a long admirer of Delilah, and could help Delilah find just the right boyfriend to make beautiful babies. We miss her everyday but are glad she is in a very loving home that isn't too far away! 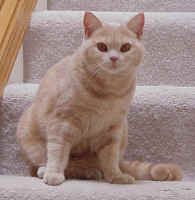 Purrdelis is very proud to announce that one of our cats earned a very distinguished honor during the 2000/2001 CFA show season. We had one regional winner who also happens to be a double regional winner, having been a winner in the Championship category last show season. Please join us in admiring and congratulating Jiggy, the latest Purrdelis' Hall of Fame inductee! 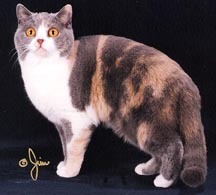 How exciting to report that our first American Shorthair, GC Caellcats Delilah of Purrdelis, has recently become a Grand Champion. Thank you to Pam Moser who succeeded in granding Delilah and Scooter Pie in the same show in two different categories -- Championship for Delilah and Premiership for Scooter (see article below.) Join us in celebrating Delilah's new title! Please join us in congratulating GC Purrdelis' Sweet Scooter Pie on his brand new Grand Championship. With assistance from Colin and Matthew Cornwall who showed Scooter at the Everett, Washington show in January (Lisa was having surgery that weekend, and missed the show! ), Scooter Pie attained his "grand" status. And before he even had a chance to catch his breath, he found himself on his way to the vet's for a little "minor surgery." And now he is plying his trade at the local shows as a Premier. Join us in celebrating this beautiful boy's achievements. We called him Barclay but his nickname was Sparky, because when the sun shone on his beautiful pale, cream spotted coat it would just sparkle. 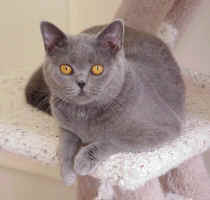 Barclay was a sweet tempered boy who joined us from the Truebrit cattery in Bremerton, Washington. Barclay was born July 15, 1999, and left the world way to soon. We miss his wonderful spirit and gentle disposition. Babycakes Finds a New Home! We are happy to report that Babycakes has found a new family to love. She's moved in with Sarah and Mike who are only about 10 minutes away. They fell in love with Baby's beauty and tell us that she will be spoiled rotten. We have no doubt at all that she will be the queen of her castle! Thank you, Mike and Sarah, for taking extra special care of Baby! This fall we welcomed a new addition to our family. Truebrit Positively 1 4 the Money -- or Barclay for short, has joined our breeding family. Barclay's dad is MrPositively Agamemnon of Purrdelis, and comes to us from the Truebrit cattery in Bremerton Washington. 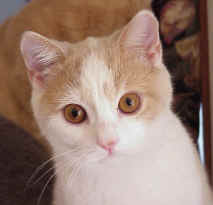 His mother is a lovely cream spotted girl who hales from the same cattery in Wales as Aggie does. Come visit Barclay at his new web page by clicking here. . .
We are happy to report that Claire and Oscar have found a new family to love. We are so pleased that they were able to go together and bring joy to their new family in Gig Harbor. Oscar wasn't too phased by the change, and settled into playtime with his new "brothers" pretty easily. Claire was a little more reserved, but we are sure she will settle in comfortably, and our prediction is that she will be running the joint in no time. Thank you Barker family for loving our babies as much as we do!